Attractive glass cabinet with 4 fixed shelves and lockable door. 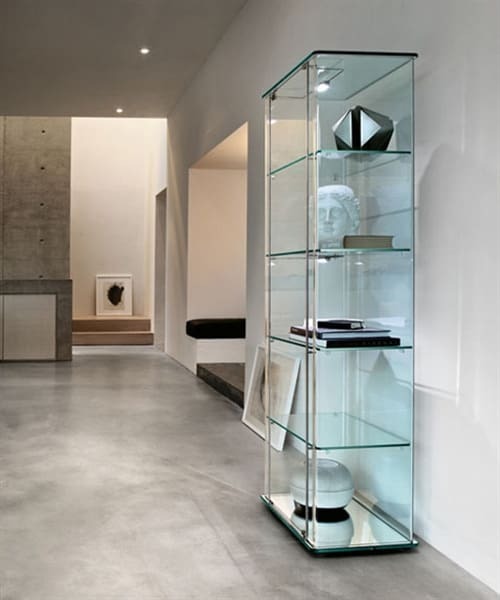 Milo Day - attractive glass cabinet / show case with 4 built-in shelves and lockable door. Two shelves are on request with LED lighting available. Showcase in curved transparent or Black95 (NERO95) glass 8 mm-thick, door in 6 mm-thick transparent glass with lock, glass shelves supports. Base in 12 mm-thick glass, available white back-stained, extralight acid-etched or extralight mirror-finish. Top in 12 mm-thick glass. Polished aluminum profiles. Four fix-positioned shelves in 8 mm-thick glass. Fitted for a lighting kit. Also available with two shelves fitted with lighting leds. Glass furniture that seems to be magic yet uses the most modern techniques in glass forming. Do you have a question about "Milo Day"? How can we contact you?